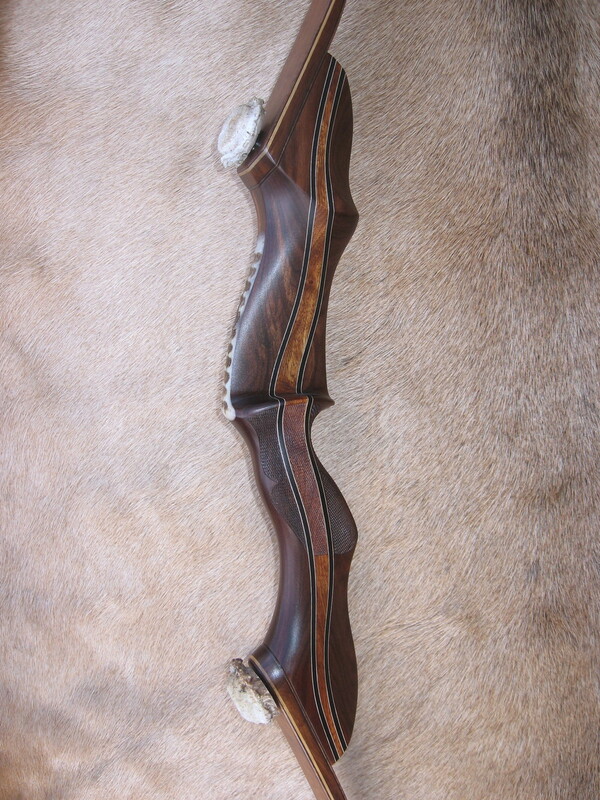 Our literature has always stated "every bow leaves the shop with an eye for beauty, excellence and love of the hunt.". We should probably add something along the lines of "and a tribute to beautiful woods and natural materials that bless our surroundings." Each of our bows that leave our shop are custom and unique to themselves. There are some options that stand out that we would consider truly "custom" in the sense that the materials and layout usually require some added input from our customer. Many of these options can be found on our price list and others may require Dave to work up an estimate based on time and materials he anticipates for the project. We enjoy challenges and the opportunity to create a truly one of a kind bow for our customers. Please share your ideas with us and we'll hope to accommodate. The standard riser lay-up is the straight stripe. In addition to this, we offer three other lay-ups pictured below. These prices include the lay-up only. Additional wood costs would be figured separately. Shapes available are "S" shape, chevron and round. The overlay shape does not change the price but the material used does. Pricing and photo examples are below. Dave does all his own custom checkering. 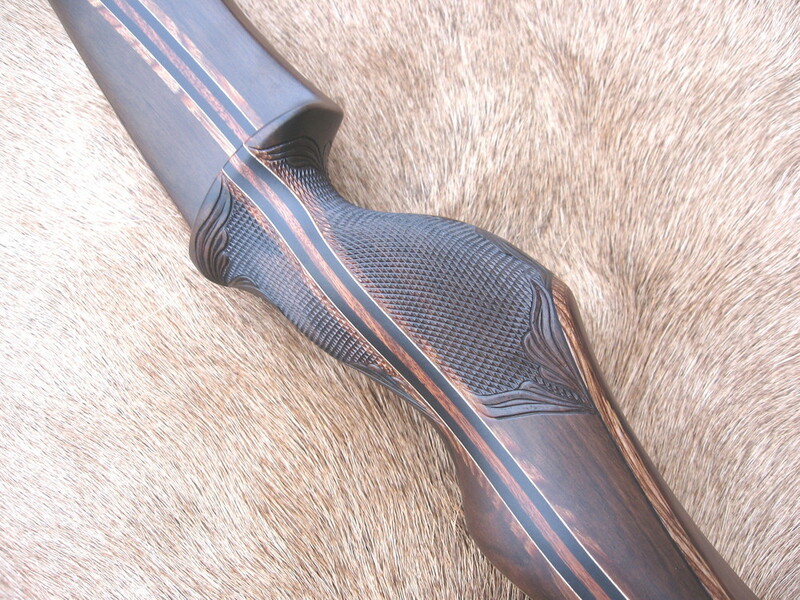 In addition to the checkering he incorporates some beautiful hand carved detail that enhances the beauty like you would see on custom gun stocks. Again, these are all custom and usually require a quote. We do have a couple basic patterns that are included on our price list. Please note that these options are "in addition" to the regular checkering option. Gaboon Riser, snakewood crescent, hand carved scrolling. Call or e-mail for quote. Scrolling in Gaboon Ebony, carving around checkering. Call or e-mail for quote. We are occasionally asked to inlay medallions, compasses, arrowheads, scrimshaw art and special trinkets the customer wishes to use to personalize a bow. Most inlays will require a quote. Here are some ideas to consider. All other inlays shown require a quote. 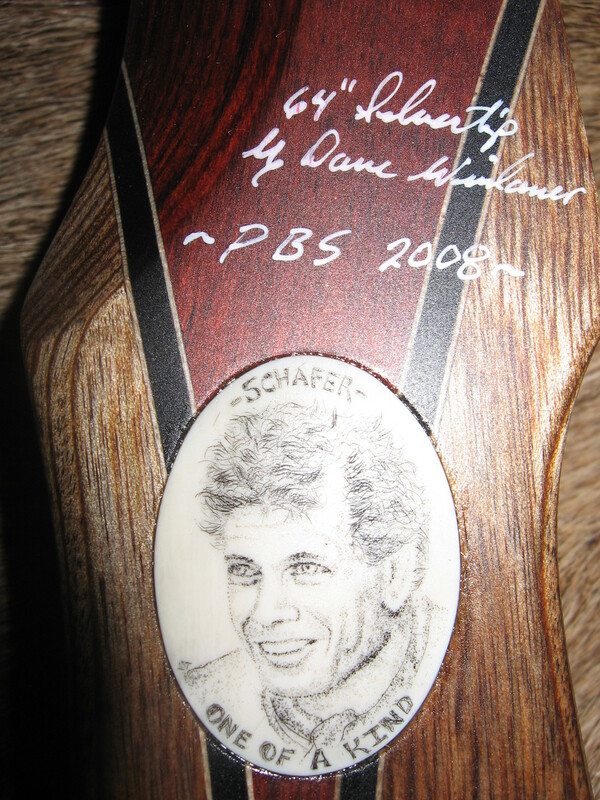 For years Dave has been asked to customize other bow manufacturers risers with his custom checkering. He is happy to do those projects and charges $180 plus shipping to do that. Turnaround depends on his schedule but usually runs around 3-4 weeks. Please call ahead to be sure we are accepting these additional jobs at the present time.